In Books Tagged In Bullying In Schools, Eastern Townships, Education, Nick Fonda, Quebec, and Short Stories. Who has never encountered a bully? Who has never told—or been told—a story of a bully? With an uncanny insight into what bullies are all about, Nick Fonda brings sensitivity and even humour to an otherwise sinister topic. Everybody knows that bullying is not limited to physical violence or intimidation and that bullies don’t necessarily look or dress like thugs. Through the voices of boys and girls, men and women, Nick Fonda recounts events and puts words to feelings and emotions that mark people’s lives. 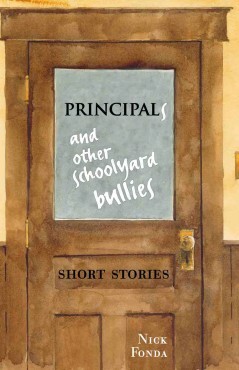 His characters include the biased principal who wreaks havoc as he protects his own pets, wicked adoptive parents, and the neighborhood tough who, with his parents’ approval, terrorizes anybody smaller than him. These eleven intriguing stories, ably illustrated by Denis Palmer, will charm, surprise, and stir readers. A thought-provoking delight for educators, parents, and students, in fact, anybody who has been confronted by abuse of power, be it subtle or flagrant. “With unadorned language and quiet resolution, Fonda (Roads to Richmond: Portraits of Quebec’s Eastern Townships) tackles childhood problems in frequently rural, wintry Canadian settings. Narrated by outcast youths or adults whose current circumstances trigger memories, these stories explore how victims learn to assert themselves or let bygones pass in the face of bullies with unclear motives. Cruelty appears as its own raison d’être; it reaches an extreme in “Sugden,” a story of suspected, attempted murder during class play rehearsals, and “The Thumb,” which concludes with evidence of dismemberment. Other stories focus on less egregious, but still emotionally-raw incidents: a home-schooled student adjusts to a mainstream classroom; a mistreated nephew rebels; a hospital worker considers delaying a former bully’s treatment. Despite the unfairness his characters face, they largely persevere, suggesting that memories of what others have said or done with ill intentions do not have to become lifelong burdens…” Publishers Weekly, Dec. 1, 2011. Nick Fonda is an award-winning reporter who has also wielded chalk in classrooms in Canada and the UK for more than 25 years. He has kept in touch with reality—other than the overwhelming reality of schools—by plying such trades as lumberjack, carpenter, restaurateur and raconteur. Nick Fonda’s non Roads to Richmond: Portraits of Quebec’s Eastern Townships (Baraka Books 2010) was remarkably successfu.